CHICAGO – Windy City Music Sound & Lighting using gear from Coemar and Barco/High End Systems for a topping-off ceremony that marked the structural completion of the Ann & Robert H. Lurie Children's Hospital of Chicago, which is set to open in 2012. The celebration took place at the Museum of Contemporary Art Plaza located across the street from the hospital site. Philanthropist Ann Lurie, Illinois Governor Pat Quinn, Chicago Mayor Richard M. Daley, hospital staff, donors, patient families and construction workers attended the festivities. "The last steel beam was signed by the workers, patients, hospital staff and patrons," said John Flaws, vice president of Windy City. "The topping off called for 30 Coemar Panorama Cyc Powers, in their dual 575-watt version," he added, noting that the light show was synched to music. The lighting design concept was to build the structure with light, "step by step, floor by floor," Flaws said, bathing the exterior in blues and greens and purples and pinks as Barco/High End Systems Showguns layered gobos of white snowflakes flowing down the sides of the building. "The Coemars acted as the base lights with the Showguns accenting the building," Flaws said. 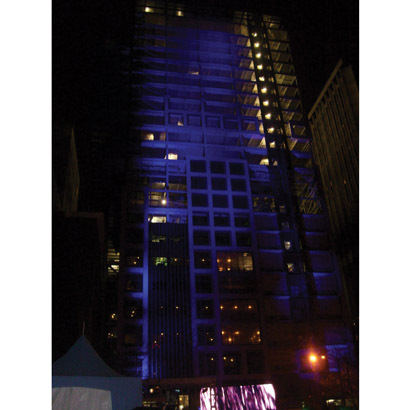 "In addition, 24 Coemar Par Lite LEDs provided truss toning on the plaza. The truss that framed the stage and the truss towers supporting the projectors and lights were wrapped in white spandex and lit from within by changing color Par LED Lites." Windy City had only a small area on the construction site in which to set up. "The Coemar lights, which are IP rated, were out for three days in the rain and snow," Flaws said. "We set them up on Saturday, programmed them on Sunday night and the ceremony took place on Monday. The Coemars were phenomenal, and everything held up very well." Justin Litterio was the lighting designer and programmer. Chris Johnson was Windy City's account executive. For more information, please visit www.coemar.com.